Shot of the shore at Cape Upstart from the boat. Wish you could feel the sting of the wind! It is fierce. This week has been good ... up until yesterday and today. Since leaving Cairns we've travelled almost 250 nautical miles in 4 days - only travelling during the day. That may not sound like a lot to those of you who don't sail or go boating so let me explain how tough that can be. Our boat - on a good day - averages about 7 knots per hour. Sometimes with gusts of wind or waves and current behind we can do 8 or 9 but that's in good or extreme conditions. Which means since Tuesday morning we've done 35 hours of sailing - an average of 8.5 hours a day - or motoring mostly - in pretty good conditions with me and the skipper only half mobile in his cast. Unfortunately the famous northerly winds of late October/early November have not materialised yet which would make the trip a whole lot easier. 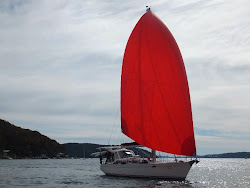 Yesterday - Friday - we left Horseshoe Bay at 0530 bound for Cape Upstart, a planned journey of 70 nautical miles which we hoped would end with the anchor dropped about 3:30pm. The wind was forecast to be from the east-north-east at a good speed of 15-20 knots. Unfortunately it came up much stronger and directly out of the southeast right on our nose. This made the waves stand up and the going much harder and altogether uncomfortable. Just as 'Southern Belle' gets her speed up she slams face first into a wave which stops her forward motion for a moment. The forecast 20 knots ended up being 25+ knots (windy) by the early afternoon. We did mange to sail some of the way which was a welcome relief from the constant sound of the engine. This meant the 10 hour trip turned out to be more like 12 and a half hours before we could get the anchor down and collapse exhausted into the cool arms of our first beer! Then, with a weather forecast for Saturday of 25+ knots again directly from the southeast, we decided we wouldn't/couldn't do it again. We would take the day off, give George's leg and me a rest and wait for the wind to change. It turns out that was a perfectly good decision! Today the wind has been ferocious .. gusting straight out of the south over 34 knots (very windy). I'm so glad we're not trying to beat into this for another 10-12 hours. I didn't enjoy yesterday. In fact I sent a text to our friend Jenny in Sydney saying if I ever get home it will be a cold day in hell before I set foot on this boat again. Extreme. Maybe. But yesterday's marathon had me ready to leave the boat - for good, for ever. I guess everyone feels that way now and again about anything but I am quite over this and ready to go home. Nothing a couple of beautiful days less windy days won't cure. Anyway, that's how we found ourselves stuck at Cape Upstart. Our little anchor is doing a gallant job of holding us in place against the maelstrom. When I finally get back home I'm going to write a letter to the anchor manufacturer to tell them just how good their product really is!! Cape Upstart is an unusual place. The Cape itself is a large outcrop of dry looking mountains loosely covered in trees jutting out into the ocean from an almost featureless area of low lying coast. The bay it forms is wide and open and becomes shallow quickly - way before a keel boat like ours can get close to the shore. There are no roads or towns or amenities here. The shore line is dotted with houses that look to be mainly weekenders or holiday houses - probably for the city/town dwellers up and down the coast. It's pretty boring to be at or look at from the boat but the mountains do a great job of breaking the impact of the wind so I'm glad to be here. Our day off has actually been terrific so far - apart from listening to the wind scream outside and endure the rocking of the boat as she pulls against the anchor while riding the wind waves. (Sorry, I'm complaining too much and I'll stop that right now!) George decided to try his hand at making fruit muffins with the frozen berries in the fridge. They came out very tasty. The DVD player is getting a workout with 2 movies down and more to come tonight I expect. Hopefully the wind will allow us to be on our way south to Airlie Beach tomorrow which is all up about another 70 nautical miles away. We'll try to do it in two days if the weather is on our side. I meant to write the final instalment of our Louisiades adventure - but I think I'm in a bit too much of a negative mindset to give that my best. So I'll save it for another time - maybe while stationary in Airlie's marina.